At one time or another, many industry professionals consider putting together a fringe production themselves in between better-paid gigs – either as a showcase, to build a CV, to work on a coveted role or text, or to practise their craft during quiet periods. And, with the Edinburgh Fringe now coming to a close, there will be companies looking to move their shows to the London Fringe. With many potential fringe venues to decide between, these are some of the factors to consider when choosing a fringe theatre. Does the venue operate the Equity Fringe Agreement ? If it does, contrary to popular belief, this seldom means the venue will pay your wages if you hire its space. It usually means the venue will oblige you to nominate someone involved in your project as the legal “employer” and therefore responsible for paying everyone. This will be in addition to paying a rental, which helps the venue pay its own in-house wages. If you are wealthy or have subsidy, you should always try to operate in this way, as professionals deserve to be paid. However, don’t forget to factor in wages/fees for the creatives and crew and how many weeks of paid rehearsals you will need to do a good job. Do your sums, as it is a significant financial undertaking. How much money would you lose if you sold a realistic amount of seats, say 50%? How much is the rent and can you get a deal? Shop around. Expect to pay around £2,000 per calendar week as dictated by the venue’s overheads and, to some extent, profile, but there are often deals you can strike, particularly if the theatre is looking to fill a slot quickly following a cancellation. The best case scenario is a box office split in your favour, which means you have no rent to pay upfront. A box office split with a guarantee on your part, to cover the rent if it is not made back through ticket sales, can also really help with cash flow. What kind of press coverage does the venue usually get? The chances are you will want your work reviewed, both to attract an audience and to boost your profile. Of late, it has become almost impossible to get a mainstream press critic to review the fringe, as newspapers cut their arts coverage right back. Whatever your opening week, you will always be competing with shows in the West End or premier league producing venues for the attention of influential critics and the few slots they have for reviews. 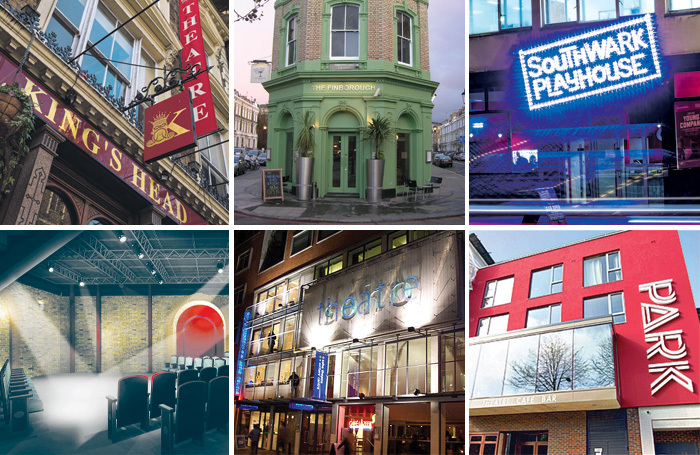 At the time of writing, I can only think of six fringe/Off-West End venues for hire where you have a slight chance of coverage in papers with a wide enough readership to make a difference – but there is no guarantee. Do your home work. Most newspaper and magazine websites have a search facility, where you can check to see if their arts journalists visit your potential venue. On the plus side, with critics unable to cover the fringe, the necessity to run for three weeks or more, which used to be the minimum number of performances required to attract significant press, no longer applies. These days, with effort, you can attract bloggers, social media and internet coverage with as little as five performances. What kind of industry coverage does the venue usually get? You are probably hoping your fringe production will attract those who can get you paid work in the future. By all means hope – in my experience if does often happen – but understand that it probably will not, so make sure you will still have a fulfilling time even if that agent or casting director you are targeting does not show. As a general rule, the smarter, more established and more central your venue is, the more likely it is that useful people will accept your invitation. Try to be near a tube station in zones 1 or 2. It makes everything easier. But, of course, these venues cost more and often have a waiting list and stringent criteria for companies they will hire to. What extras will the venue provide? Free audition and rehearsal space can save you a fortune. Marketing by the venue is also good, if rare these days, beyond an email-out or a few social media postings. Even if they do promise marketing support, always plan to do the heavy lifting yourself. It is in your interest and not theirs to try to generate enough sales to make a little of your investment back. With rental on an established venue so high that you have very little chance of making your money back, even if you sell out or everyone involved is volunteering, and with no guarantee of major press coverage or industry attention even then, why not spend your money on staging your project in a new or unconventional performance space?